At the June 2018 European summit the leaders spent most of the time discussing immigration restrictions. Yet the Syrian rush through the Mediterranean is now a trickle. African migration is down by 95%. The heads of state went backward, spending most of the summit’s time on yesterday’s problem. Macon wanted to focus on the future to stave off a repeat of the near collapse of the Euro eight years ago. Just before the summit he and Chancellor Angela Merkel of Germany fashioned the Meseberg Declaration, an eight-page document. The two countries make up nearly half of the Eurozone economy. The novel idea pushed by Macron and, until Meseberg, resisted by Merkel is a Eurozone budget. The smaller countries like the Netherlands and Denmark don’t see a need for it. Macron sees it as a must priority for Europe. The next summit is in October 2018. Macron in his usual way (he only takes four hours’ sleep) will argue and push to make sure that he will then get the go ahead. A lot depends on Merkel, Macron’s good buddy, still being in power. Only she can stand up to the German economists and politicians who resist the idea. Who is this Emmanuel Macron? He came up so fast and unexpectedly in the May election last year that we non-French only know him superficially. A new book, Revolution Francaise by the long-time Paris Bureau Chief of the Economist, Sophie Pedder, gives us real insights. It’s a piece of writing that has dug deep into his character and activities, laced with many interviews. 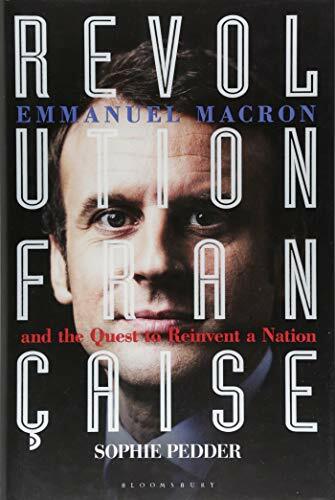 After reading the book it becomes clear that if anyone has the brain, the clarity and the forcefulness to drive Europe into the future it’s Macron. “The politicians’ word is exhausted”, he told Pedder. Although not a religious man he has a moral instinct. He wants to pull Europe further together so it can live up to its founders’ aim to avoid any more war on a continent that has seen more wars than any other part of the world. Macron is certainly not a conventional person. His whole campaign for the presidency when he shoved aside the traditional parties including the quasi-fascist but popular National Front, broke all the rules. His romance and later marriage with a woman 23 years older than he, which began when he was a schoolboy and she his teacher, is rare in any country. It still looks strong after many years of togetherness. As Christian Dargnat, a friend said, “He puts his own liberty above everything.” This seems to give him the conviction he needs to push his antiquated country and Europe forward. Already he has done what every recent president has failed to do: persuaded the unions that they can’t avoid root and branch reforms. Many if not most thought that this was an impossible task. It impresses the Germans who are worried about France’s long-time economic profligacy. In one interview Macron told the author, “If we want a modernizing agenda, we need to put together two-thirds of the Socialist Party [of which he used to be a member], all of the centrists, and part of the centre-right. That would give us a pro European market-friendly majority in favour of modernizing the social model.” For starters 45% of his party’s members of parliament are women. His attitude to the economy has been much influenced, writes Pedder, by the Indian economist Amartya Sen who won the Nobel Prize. Sen has shown that a more equal society produces more growth as well as empowering the people. Sen, Macron says, “structured a lot of my thinking on social justice.” One of the first measures Macron put in place was to halve the size of primary-school classes for five and six year olds in poor neighborhoods. Before his own presidential campaign, reports Pedder, Macron watched replays of Donald Trump’s speeches. He grasped the way in which Trump forged a link with the people, using their language and harnessing anti-establishment rage. Of course, he’s not Trumpian. He’s more like Obama, cerebral and unflappable. Unlike Obama he has a majority in Parliament. Macron is going to get things done. His method is motion.